Most Google apps are constantly getting small updates, but Snapseed tends to get fewer updates with more stuff in each one. 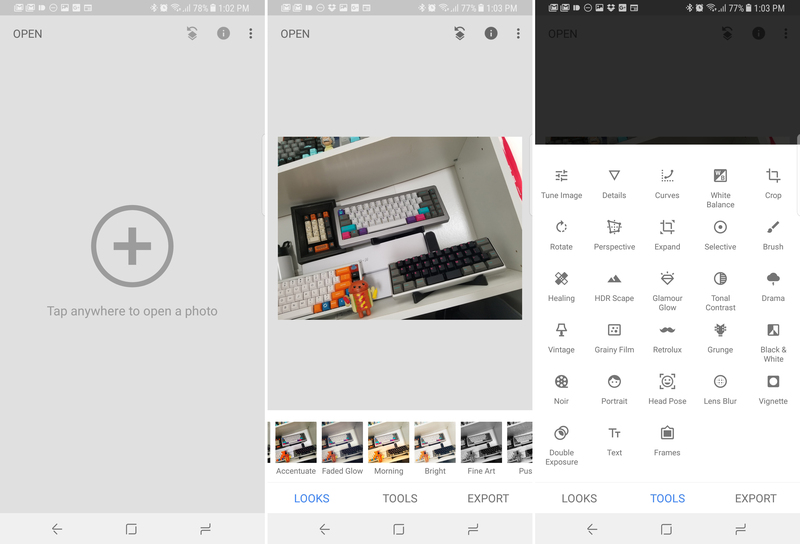 Today, Google is rolling out Snapseed v2.18. It's a strange version number to choose for such a major update (the last one was 2.17). You get a new, lighter interface with a bottom bar to access all the app's editing tools. There are still a lot of sliders, though. Opening the app, it's immediately clear things have changed. The screen instructing you to pick an image is now light themed instead of dark. That vibe is carried throughout the app, including the three light tabs at the bottom that provide access to all the functions. Previously, the app had a scrollable list of everything that could be a little cumbersome (see below). Now, you get looks (filters), tools, and export at the bottom of the app. All the individual filters and tools are still controlled with Snapseed's characteristic swipe interactions. So, if you're a big Snapseed user, you won't feel completely lost after this update. It's still rolling out in the Play Store, but we've got the new version on APK Mirror if you want to grab it now.